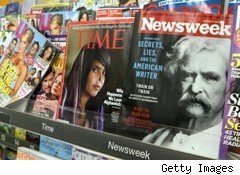 The citizens of Red State America are hopping mad, and they're doing something about it: buying magazines. Among the fastest-growing publications in the first half of 2010 were a slew of titles for gun lovers, hunters, conservatives and NASCAR fans, according to figures just released by the Audit Bureau of Circulations. They include Newsmax, the right-wing title whose publisher recently made an unsuccessful bid to buy Newsweek, which was up 92.6% in circulation, with an average of 181,985 readers; NASCAR Illustrated, up 33.7% to 123,603; and America's 1st Freedom, a publication of the National Rifle Association, which was up 22.6% to 606,669. American Rifleman, American Hunter and North American Hunter all also made the list of the 25 fastest-growing titles, as did All You, the Time Inc. (TWX) women's magazine that's only sold at Walmart (WMT) stores. But if all those Sarah Palin supporters stopped to scope out their fellow newsstand shoppers, they might have noticed an awful lot of people wearing Birkenstocks and carrying hemp tote bags. Readership of Clean Eating, a natural-food magazine from Robert Kennedy Publishing, was up 44.4%, Organic Gardening grew 25.8% and Vegetarian Times was up 7.8%. The fastest-growing publication of all was also a food magazine: Food & Family, which increased its circulation an eye-popping 650%, to 1.08 million. But that growth is somewhat misleading: Kraft Foods (KFT), which publishes the title, only started charging for it last year, allowing it to claim copies it was already distributing as paid circulation for the first time. Overall, the industry-wide trend was down for both subscriptions and single-copy (ie., newsstand) sales, although somewhat less steeply than it has been in recent years. Aggregate single-copy sales declined 5.63%, while aggregate subscription sales fell 1.96%.